Whether you need to do tillage or planting in the spring, spraying in the summer or harvesting in the fall, your Case IH AFS Pro display is at the heart of the task. Count on a single intuitive interface to connect with all your equipment and monitor your performance, even with mixed fleets. Move it from vehicle to vehicle to spread the investment across your entire operation. Contact Brian Rigby at 208-852-0430. The AFS Pro 700 display is factory installed to save trouble and time during critical seasons. A single, customizable, intuitive, easy-to-read display is used with Case IH tractors, combines, cotton pickers, sprayers, balers, planters, seeders and tillage to control and monitor key functions and track important information. The integrated platform, designed for open architecture, enables compatibility with all the equipment in your farming operation, as well as the systems from your outside suppliers, including co-ops, crop advisers, financial advisers and more. 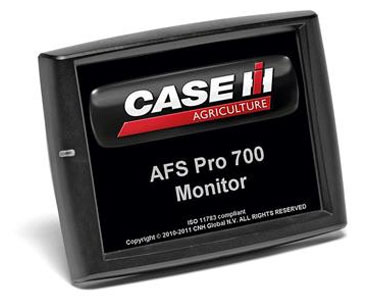 And you can easily take your AFS Pro 700 display from one piece of equipment to another, no matter the color. See all CASE IH Advanced Farming Systems including guidance, automatic steering, sprayer boom control, yield mapping, AFS displays, AFS AccuGuide, AFS Connect, Receivers and Modems.